What is ITSM (IT service management)? ITSM is the process of designing, delivering, managing, and improving the IT services an organization provides to its end users. ITSM is focused on aligning IT processes and services with business objectives to help an organization grow. ITIL® is a framework of best practices and recommendations for managing an organization's IT operations and services. It was commissioned by the UK Government's Central Computer and Telecommunications Agency (CCTA) in the mid-1980s. ITSM processes, when built based on the ITIL® framework, pave the way for better IT services and improved business. To summarize, ITIL® is a set of guidelines for effective ITSM. 86% of service desks use the ITIL framework. However, the use of ISO/IEC 20000 (29%) and DevOps (11%) has increased in recent years. Irrespective of the size of business, every organization has ITSM involved in some way. 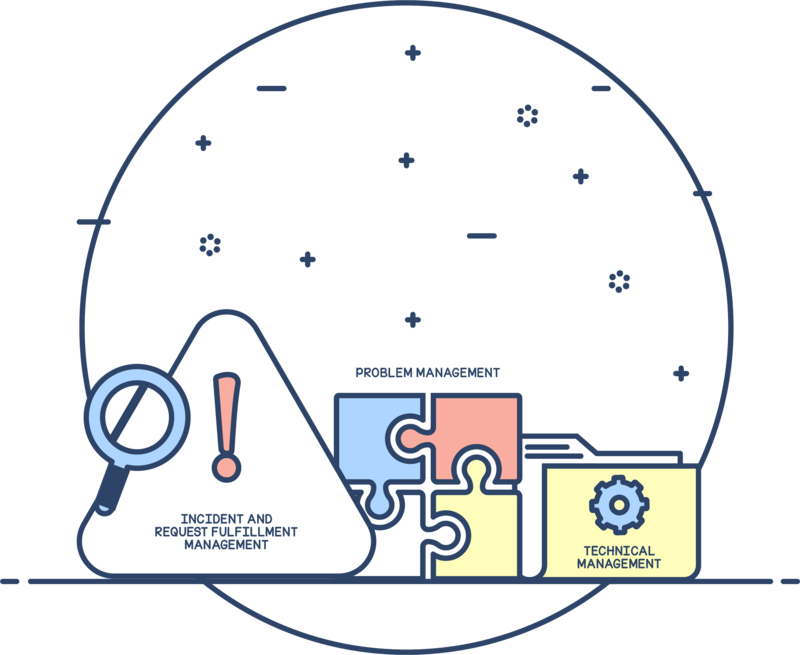 ITSM ensures that incidents, service requests, problems, changes, and IT assets—in addition to other aspects of IT services—are managed in a streamlined way. IT teams in your organization can employ various workflows and best practices in ITSM, as outlined in ITIL®. Assessing the organization's market, offerings, and competition, and developing a strategy for IT services. Managing the service catalog to ensure it has the right IT services, within the defined level of investment, to cater to customers. Managing the organization's budget, accounts, and bills. Understanding and anticipating the demand for the defined IT services, and ensuring that the organization has the capacity to meet customers' demands and needs. Identifying the needs of end users, ensuring that the right services are developed to meet their requirements, to maintain a positive relationship with customers. Managing designs to ensure that the newly designed or modified services, information systems, technology, and metrics are consistent and effective. Creating and maintaining a service catalog that provides all information pertaining to the organization's IT offerings, their present status, and interdependencies. Identifying potential risks caused by IT service processes, recording them with their impact and plausible workarounds. Defining service-level agreements based on discussions with the customers, to ensue that services are designed based on them. Analyzing the capacity of the offered IT services and ensuring that they suffice to meet the expected and agreed service-level targets. Managing all aspects of the availability of IT services. Managing risks to ensure that at least the minimally agreed service levels are met, so that there's no disruption to business continuity. Maintaining data security, as well as protecting the confidentiality and integrity of the organization. Ensuring IT services comply with enterprise and legal policies. Planning and developing the future of the organization's technological landscape based on new technologies that are available in the market. Managing contracts with suppliers to ensure that suppliers meet their contractual commitments. Once the designs for IT services and their processes have been finalized, it's important to build them and test them out to ensure that processes flow. IT teams need to ensure that the designs don't disrupt services in any way, especially when existing IT service processes are upgraded or redesigned. This calls for change management, evaluation, and risk management. No transition happens without risks and it's important to be proactive during transitions. 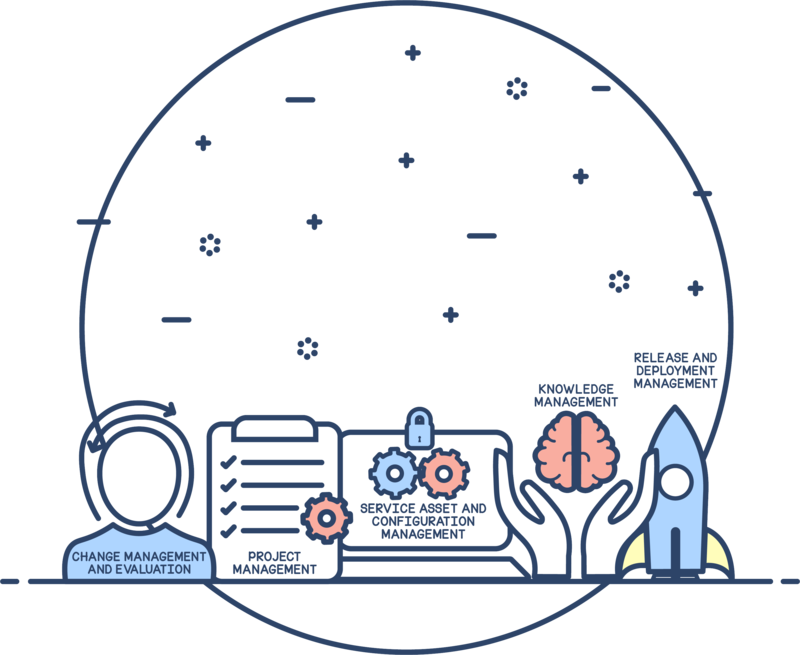 Controlling the life cycle of any IT change, including operational, strategic, or tactical changes. Planning and managing major release activities. Maintaining a shared IT knowledge base within the organization. Maintaining and managing IT assets that are required for the offered IT services, and their configuration items (CIs). Planning, scheduling, and controlling the deployment of various releases to ensure minimal disruption to existing services. Ensuring that all IT incidents are resolved at the earliest and service requests are attended to within the agreed service level targets. Managing all IT problems, minimizing the impact of IT incidents that led to the problem, and coming up with a solution or a workaround. Managing the IT infrastructure with the most appropriate technical expertise and support. Reviewing offered services and the IT infrastructure to identify any areas that may require improvements. Monitoring processes constantly and evaluating them to ensure that the benchmark is maintained. Defining and monitoring CSI initiatives to ensure that the CSI activities are being carried out as per the plan, and to fix any hiccups that may occur along the way. 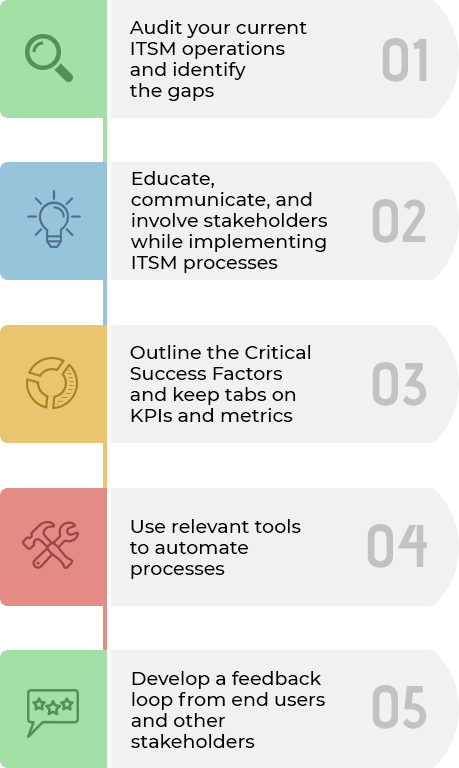 Before implementing ITSM processes in your organization, it's best to identify your organization's early goals and then work your way up. When it comes to implementing ITSM workflows, there's no one-size-fits-all approach. Therefore, it's important to carefully identify the areas of IT where ITSM processes can be; involve the right people; deploy the relevant technology; choose the right workflows; be aware of what's at stake and the potential risks involved; and be prepared with strategies for recovery in circumstances where initiatives fall through the cracks. According to a McKinsey report, 70 percent of change projects fail because management is unable or unwilling to help employees embrace the change. To prevent this, your organization needs to create a culture that is receptive to change. This can be done by ensuring that all stakeholders are convinced about the benefits of strategizing and implementing good ITSM processes, and communicating with people outside the core implementation team through workshops, meetings, etc. to ensure that everyone involved is on the same page. The ratio of the number of successful changes to the total number of changes that were executed in a given time frame. A highly stable infrastructure is characterized by maximum availability, very few outages, and low service disruptions. Total number of tickets handled by the IT help desk and their patterns within a given time frame. Percentage of incidents resolved by the first level of support (first call or contact with the IT help desk). Percentage of incidents resolved within the agreed SLA time. The total monthly operating expense of IT support, divided by the monthly ticket volume. Percentage of software products and licenses in actual use by the business. Time taken to resolve an incident. Number of tickets that are reopened after being resolved. Time taken to resolve a problem from the moment the problem is identified. IT help desk management solutions simplify the implementation of ITSM processes by providing out-of-the-box best practice processes and workflows. Most help desk software include automations, real-time analytics, customizable ITSM processes, and so much more. That, coupled with the right processes, shifts IT teams' focus from fire-fighting to strategic business objectives and growth. It's also important to choose an IT help desk tool that fits your organization's IT needs, instead of blindly investing in a high-end tool, or one that promises a wide range of features. More often than not, you aren't going to use all the functionality available right away. It's wiser to invest in a tool that is customizable and flexible to match a big part of your current IT requirements, with the ability to scale up in the future. You should look for a tool that's practical, user-friendly, and includes integrations with other IT management tools to ensure that you go to one place for your IT management processes, instead of scrambling around multiple, siloed tools. And of course, it goes without saying that the software must be budget-friendly. Bad feedback: "Your IT technicians are great." Good feedback: "The way your IT technicians handle requests is great. Danny, my sales rep, knew exactly what I was looking for and helped me find the add-in that saved me a lot of time and effort. I'd like to make a suggestion as well. It would be great if the add-in could work for Office365. All in all, I'd definitely recommend your help desk tool." Although the first example was positive, it was shallow and didn't provide anything constructive. The good feedback, on the other hand, provided information that could be used for improvement and was also a good endorsement for the product. Stats show that 32% of service desks identify ITIL v3/2011 as their main ITSM initiative, while 29% chose Six Sigma, 27% chose Balanced Scorecard, 24% chose ISO 19770-1, 21% chose Capability Maturity Model Integration (CMMI), 20% chose ITIL v2, and 20% chose Control Objectives for Information and Related Technology (COBIT). Based on business goals, decide which key ITSM processes need to be implemented and chart out the integrations that need to be established to achieve those goals. For example, if many of your IT changes are dependent on incoming incident requests, look for a tool that has a tight integration between these two ITSM processes. Participate in business expos, webinars, demos, etc., and educate yourself about the various options that are available in the market. 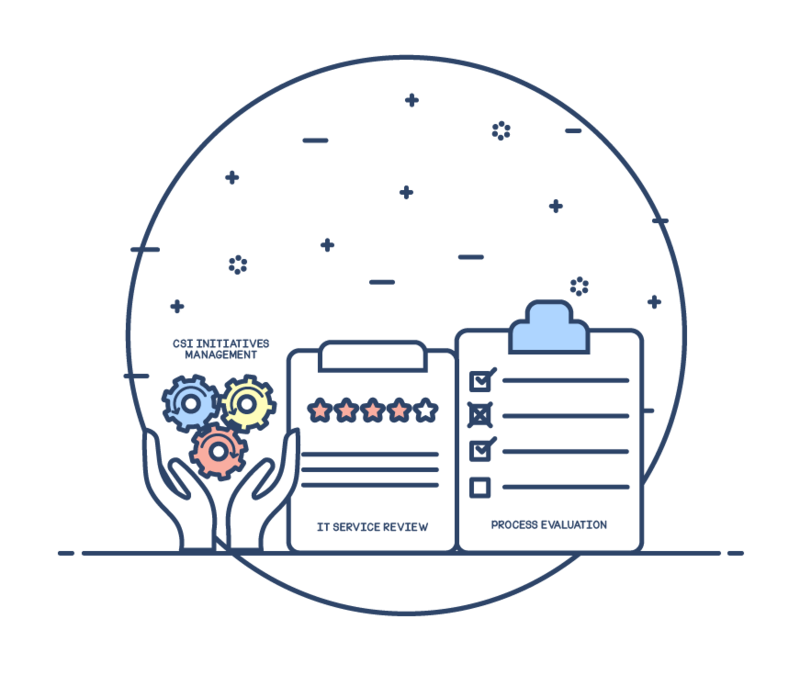 Reports from expert analysts such as Gartner and Forrester are particularly useful as they include reviews of almost every solution, ranked based on multiple criteria. Every business has a different IT infrastructure model. Selecting an on-premises or software as a service (SaaS) ITSM tool depends on whether your business prefers to host its applications and data on its own servers or use a public or private cloud. More often than not, it's easy to get carried away by the vastness of the offerings an ITSM tool provides. It's therefore important that you're clear about the requirements to run IT services in your organization and prioritize them. You should look no further into an ITSM tool if it doesn't meet your basic requirements even if it does appear to offer fancy features that may be a luxury but will not suffice your basic necessity. Although it's important to consider the "needs" primarily, you shouldn't rule out the secondary or luxury capabilities. If the ITSM tool doesn't have the potential to adapt to your needs as your organization grows, it can pull you back from progressing. Draw a clear picture of where your business is headed and choose an ITSM tool that is flexible and technology-driven. Keep a list of your requirements and preferred deployment method and match it against the capabilities of existing ITSM tools. As previously discussed, classifying your feature requirements into “must-haves” and “good-to-haves” can help cut down the list of tools that could work for you. It's important to carry out a request for proposal process, listing features and assigning weights to different elements such as price and support. Once you reach this stage, it's a good idea to let your technicians try out a couple of different products that are available as free trial versions and monitor their user experience. From there, you should be better informed to make your choice. It might be tempting to assess an ITSM tool based on its capabilities and features but it's important to evaluate the vendor of the tool. A good IT support team, and a vendor that is endorsed for their customer-vendor relationship can take your IT services far. Check Gartner's magic quadrant and other analyst reports, along with product and support reviews to ensure that the said tool provides good customer support. 67% of service desk users chose product features and functionality as the top selection criterion for a new ITSM tool, while 65% chose self-service capabilities, 53% chose the ability to easily configure and customize, 45% chose access to quality support, 45% chose the ease of use and the UI, and 24% chose ESM/enterprise capabilities. IT support has evolved over the years, dictated by factors like business needs, work culture, technological innovations, and the ever-changing IT landscape. IT help desks have transformed into IT service desks which handle a wider spectrum of IT operations and better align with strategic business goals. These IT service desks are supported by ITSM tools that provide increased functionality and usability. The road, of course, doesn't end here; ITSM is bound to continue to evolve. Here are some hot trends which will fuel the evolution of ITSM in the coming years. The role of IT support is to make sure that IT services help employees with their work. Increased expectations of IT employees have shifted the focus of IT towards providing a better consumer experience. This includes enabling a multichannel communication process, introducing chatbots, as well as providing a compelling IT shopping experience with service catalogs and promoting self-help with access to a knowledge base. Providing a better consumer experience improves the IT department's reputation and creates a work environment free of frustration for both end users and IT technicians. One reason for the push to automate is that some security standards are based on ITIL®; many organizations are well aware that automating ITIL® processes can help them sail through compliance audits. Extending automation to other workflows and processes can help decrease inconsistencies and increase efficiency in help desk operations as well. With the automation of help desk tasks, end users benefit from improved resolution times. Whether an organization decides to adopt a bring your own device (BYOD), bring your own technology (BYOT), or choose your own device (CYOD) culture, these up-and-coming IT policies always carry the threat of shadow IT. With BYOD, challenges arise in terms of asset management, software license compliance, and extending IT support to a wider range of devices. Without a proper strategy to handle this culture, businesses can face increased IT costs and business disruptions. BYOD adds to the complexity of an IT environment, making impact analysis during a problem more challenging due to low visibility on employees' personal devices. Mobile device management capabilities like remotely wiping devices, deploying profiles, restricting devices' access to Wi-Fi and VPN, and adjusting devices' email settings could help technicians cope with this BYOD culture. The current generation of IT consumers are increasingly submitting incidents or requests through social media rather than conventional methods like email. Based on this trend, IT help desk technicians can leverage the power of social media as a powerful ITSM enabler. You should look into integrating social media platforms with your help desk tools to allow your help desk technicians to receive and respond to tickets, converse with end users, and resolve issues. With multiple touch points across an organization, IT has access to a huge volume of data, which can be used to generate business-critical insights. These insights can reveal problems in business and IT at the earliest stage, reducing costs and risks while increasing the quality of IT service delivery. 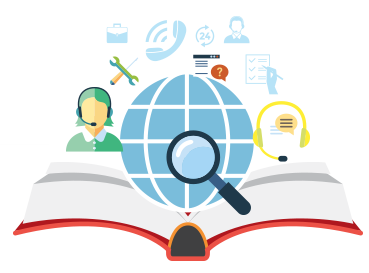 Help desk software has started integrating with business intelligence solutions to mine valuable information from help desk data. For example, a basic SLA compliance level chart only indicates when SLA compliance levels sky-rocket or plunge, but doesn't necessarily help you understand why SLA levels are changing. Performing deep dive analytics with business intelligence tools can help identify the factors that are negatively affecting SLA compliance levels and the ways to fix them. ESM is expected to be a natural successor of ITSM. ESM is all about applying the principles, processes, and best practices of IT service delivery to every functional area within a business. ESM helps effectively integrate different departments and facilitates quicker flow of operations across departments. Though many vendors have already started talking about ESM capabilities in their tools, for now a complete ESM solution is only a vision that the industry is moving towards. Predict issues and problems proactively. Improve search capabilities and knowledge management. Classify and route issues more easily. These seven trends have the power to shape the future of ITSM, but ManageEngine's ITSM Future Readiness Survey Report points to even more advances in ITSM. While implementing ITSM processes in your organization, you should ensure that your prospective ITSM solution is capable enough to address trends and provide a competent, future-proof way to deliver better IT services. The implementation and management of quality IT services that meet the needs of a business. 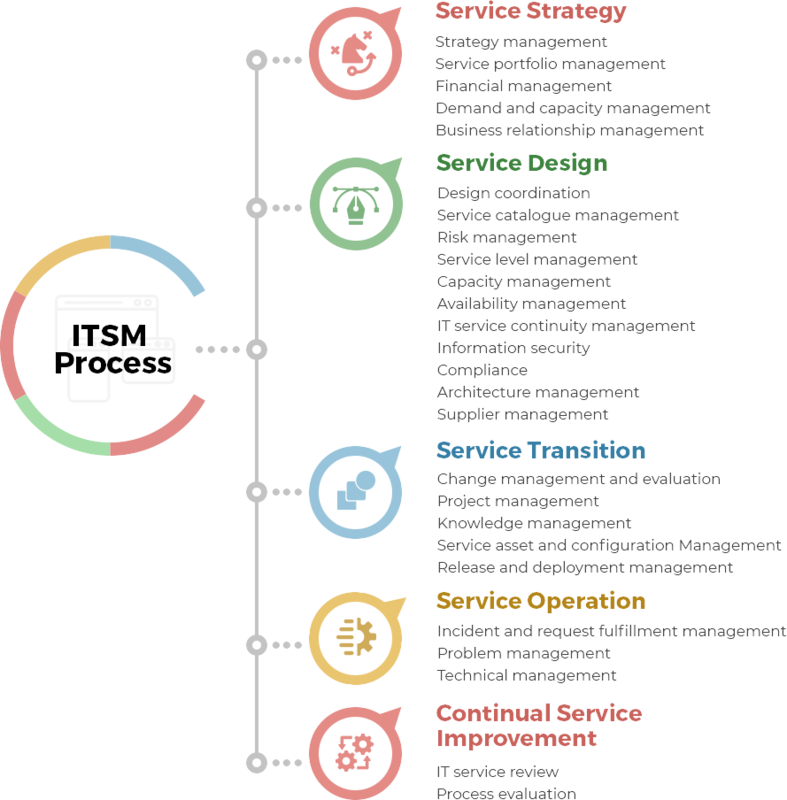 IT service management is performed by IT service providers through an appropriate mix of people, processes, and information technology. The process responsible for managing the life cycle of all incidents. Incident management ensures that normal service operation is restored as quickly as possible and the business impact is minimized. The process responsible for managing the life cycle of all problems. Problem management proactively prevents incidents from happening and minimizes the impact of incidents that cannot be prevented. Transitioning something newly developed (i.e. an update to an existing production environment or something entirely new) from the service design phase into regular service operation, all while aiming to ensure that standardized methods and procedures are used for efficient handling of all changes. A generic activity or process responsible for tracking and reporting the value and ownership of assets throughout their life cycle. A set of best-practice publications for IT service management. ITIL® gives guidance on the provision of quality IT services and the processes, functions, and other capabilities needed to support them. The ITIL® framework is based on a service life cycle and consists of five life cycle stages (service strategy, service design, service transition, service operation, and continual service improvement), each of which has its own supporting publication. A software licensing and delivery model in which software is licensed on a subscription basis and is centrally hosted by the vendor. It is sometimes referred to as "on-demand software." A metric that is used to help manage an IT service, process, plan, project, or other activity. KPIs are used to measure the achievement of critical success factors. Many metrics may be measured, but only the most important of these are defined as KPIs and used to actively manage and report on processes, IT services, and activities. Help desks should select KPIs to ensure that efficiency, effectiveness, and cost-effectiveness are all managed. An official commitment that prevails between a service provider and a client. When defining SLAs, the service provider and service user agree on particular aspects of the service, including quality, availability, and responsibilities. Software that is installed and runs on computers within the premises (in the building) of the person or organization using the software, rather than at a remote facility such as a server farm or cloud. Refers to using a network connection to access applications and data stored in other locations, often by accessing data centers using wide area networking (WAN) or regular internet connectivity. A self-service portal is a website or app that enables users—whether they're customers, employees, suppliers, or partners—to perform high-value transactions, from simple account updates to paying bills, managing support tickets, and more. A database or structured document with information about all live IT services, including those available for deployment. A service catalog is part of a service portfolio and contains information about two types of IT services: customer-facing services that are visible to the business, and supporting services the service provider requires to deliver customer-facing services. A logical database containing data and information used for knowledge sharing and management. An unplanned interruption to an IT service or reduction in the quality of an IT service. Failure of a CI, even if it has not yet affected a service, is also an incident (e.g. failure of one disk from a mirror set). A methodology used in problem management to analyze the core issue (root cause) that led to a series of incidents. The root cause is an element or factor that, when removed, restores normalcy and prevents the problem from reoccurring. A repository of previously identified and recorded errors or root causes with tested workarounds, which can be used as reference for similar problems in the future. A temporary solution to a known error that minimizes or eliminates the impact of an incident or problem. The time taken to respond to a logged ticket. The first response time refers to the time taken to respond to a ticket for the very first time after it was logged. The time taken to resolve an incident or problem and bring it to closure. An organized process that involves the planning, organizing, managing, and controlling of IT projects to accomplish specific IT goals. Managing a service organization with a suite of ITSM tools and applications applied to ITSM software to optimize its performance. ESM enables departments within an organization to stay connected to each other and to external resources, thereby functioning as a single unit across all facets of service management. 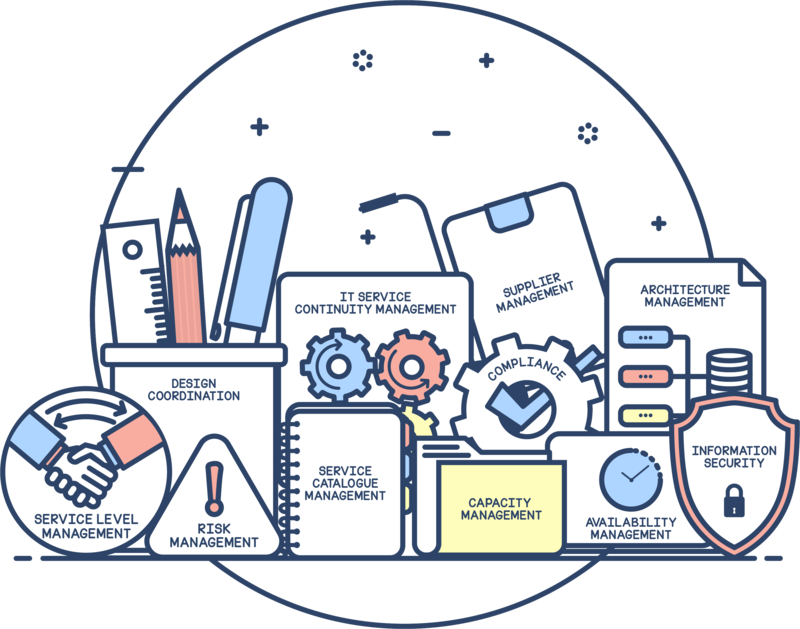 ManageEngine's flagship product, ServiceDesk Plus, is an ITIL-ready service desk software used by ITSM professionals worldwide. With industry-certified best practice ITSM functionality, easy-to-use capability, and native mobile apps, ServiceDesk Plus leverages the latest technology to help IT support teams deliver world-class service to end users with reduced costs and complexity. Available in both cloud and on-premises versions, the software is available in three editions, and 29 different languages. 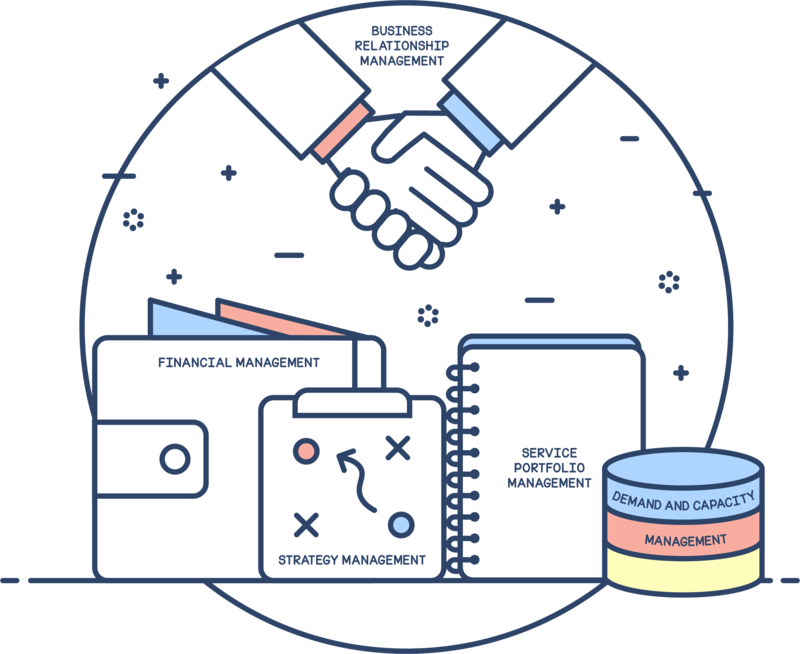 Over 100,000 organizations across 185 countries trust ServiceDesk Plus to optimize their IT service desk performance and be future-ready in their IT service management operations. For more information on ServiceDesk Plus, please visit manageengine.com/products/service-desk.